If you are visiting this web-site, chances are you’re looking for a Glendale bail bondsman. Our company can help you through this difficult time. In addition to Glendale bail bonds, our company services all of Southern California and most of the state. We are a A+ rated company with the Better Business Bureau. Our family has been in the bail business for over 40 years. Let us help you with your Glendale bail bond needs. Please call us locally at 818-348-8551. We provide 24 hour free bail bond information. When a defendant first arrives at the Glendale jail, the Glendale Police will “book” the prisoner. This process can often take 2-8 hours. It process will include mug shots, finger prints, checking a nationwide database for warrants, documenting personal property and similar activities. Once the inmate is processed, bail will be set. Note that a bail bond company cannot “post bond” until the booking process is completed. However, if you call us we can often give you jail information and a good idea about the bail amount and help you to understand the bail bond process so that you make decisions about how to proceed. In many cases, if the defendant does not bail out quickly, they may be transferred to the main County jail (Downtown Los Angeles, known as Twin Towers or Men’s Central Jail). While we do offer Twin Towers bail bonds, we recommend that our clients to bail out as quickly as possible to avoid being transferred to the Los Angeles County jail. It is one of the largest jails in the world and it can be a horrifying experience. When you call us, we will handle everything. You probably won’t even need to leave your house. With today’s technology, we can often transact the entire bail bond process by phone, fax, e-mail and e-sign. Most customers utilize our “bail by fax” program that helps speed up the process. If you prefer, you can come to our office or we can have a California licensed bail agent to you in less than an hour. The bail amounts are set by Los Angeles County judges on an annual basis. Bail is intended to be in accordance to the severity of the offense and substantial enough to make certain the defendant appears for court dates. You may take the full amount of the bail to the jail or they may utilize a bail bondsman for a fee of 10% of the bail. At Greg Rynerson Bail Bonds, we offer various bail bond payment options and often can arrange no collateral bail options. 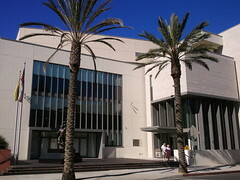 The Glendale City jail opened its new facility in January 26, 2005. The facility has 48 cells and 100 beds. This jail is the 3rd busiest municipal jail in Los Angeles County. It is estimated that approximately 600 inmates are booked in on a monthly basis. Glendale being one of the San Fernando Valley's largest cities, this is not surprising. we offer additional pictures the Glendale Police Station here. If you choose to visit somebody that is in custody, you should be aware that this jail has very stringent visiting regulations. Most visits are via a video link. Generally, the visiting hours are between 1 - 4 PM daily (note that professionals such as bail bondsman, attorneys, clergy and police will have more generous access to prisoners). Visits are only 15 minutes long. We recommend that you phone the jail prior to your visit. Uncertain of how to proceed? We are available to answer your bail bond questions: 818-348-8551 or toll free at 888-224-5266.